Kudos to Feeders Supply! This company is well-known for helping local animal shelters and rescue organizations find homes for homeless animals year-round. This holiday season, once again, for the 30th year, Feeders Supply will host Santa Claus and hundreds of volunteers in their 21 stores to help local animal rescue organizations in the Picture Your Pets with Santa event. Notably, 100 percent of the proceeds from this event will go to help homeless animals. The company takes NO cut! Picture Your Pets with Santa takes place the first two weekends in December. This year that will be on Saturday and Sunday, December 2 and 3 and Saturday and Sunday, December 9 and 10. On the two Saturdays, December 2 and 9, the event runs from 10:00 a.m. until 4:00 p.m. On the two Sundays, December 3 and 10, it starts at 11:00 a.m. and goes until 4:00 p.m.
All animals are welcomed, according to the Kentucky Humane Society. Although dogs and cats are the most popular pets brought in for photos, in past years, Santa has had his picture taken with chickens, bearded dragons, rabbits and the occasional horse, among others. Pictures with horses are taken outside the stores, of course. The photographs are taken by professional photographers and various packages of prints are offered, starting at only $12. One of the neatest things, I think, is that you can have the photos printed on Christmas ornaments, coffee mugs and key chains. And the price of these special gift items starts at only $14. A great deal in my opinion. Here's how the funds raised from Picture Your Pet With Santa will be distributed. In Louisville, proceeds from 11 stores will go to the Kentucky Humane Society. These 11 stores are Dixie Highway at 10948 Dixie Hwy., Elizabethtown at 1610 Ring Rd., Fern Creek at 6820 Bardstown Rd., Hikes Point at 3079 Breckenridge Lane, Holiday Manor at 2236 Holiday Manor Center, Middletown at 12949 Shelbyville Road, North Dixie Highway at 4921 Dixie Highway, Pewee Valley at 12406 La Grange Road, Preston at 5763 Preston Hwy., Springhurst at 9486 Brownsboro Rd., and St. Matthews at 4600 Shelbyville Rd. Proceeds from the LaGrange store at 1806 Milestone Village Drive will go to the Humane Society of Oldham County. The two Feeders Supply stores in Lexington, one at 306 Southland Drive and one at 3080 Richmond Road will raise funds for the Lexington Humane Society. Three stores will raise money for the Floyd County Animal Rescue League in New Albany, Indiana. These stores are Clarksville (Indiana) at 229 E. Lewis and Clark Pkwy., New Albany (Indiana) at 3400 Grant Line Rd., and New Albany (Indiana) at 2221 State St. The proceeds from the Picture Your Pets with Santa event at the store in Shepherdsville, located at 187 Adam Shepherd Parkway, will go to Saving Sunny, a nonprofit rescue and foster organization based in Louisville. The Downtown Louisville store at 315 Baxter Avenue will raise funds for the Shamrock Pet Foundation, a nonprofit animal rescue in Louisville, run by volunteers. And of course, the one most important to me is my local store in Frankfort, located at 1303 US Hwy. 127 South, which will raise funds for the Franklin County Humane Society. If you don't care about having a photo taken, visit the store anyway and think about becoming a regular customer if you're not already. This company works year-round with local shelters and animal rescue organizations to help homeless animals find a forever home. The numbers are quite impressive in what Feeders Supply has done over the years to help local shelters. A bit of background -- the company partnered with the Kentucky Humane Society in Louisville, beginning in 1996 to allow adoption events inside the Louisville stores. This effort spread to other locations and other shelters. For example, in my hometown, Frankfort, Kentucky, the local store hosts weekly adoption events for the Franklin County Humane Society, Frankfort's local nonprofit shelter. As of this writing, November 30, 2017, 50,000 animals have been adopted through the company's adoption centers. In addition, Feeders Supply has donated 104,000 pounds of pet food and 7,000 pounds of cat litter to local animal rescue organizations. The company has raised $750,000 through their programs and $1.8 million in cash and in-kind donations have been given to animal rescue organizations to date. Remember this is a regional company not an international conglomerate. Quite impressive, I must say. I use the Frankfort Feeders Supply pet bathing facilities for my clients' pets quite often and the employees at this store are great to work with, in my personal experience. The store has a wide selection of pet foods, wildlife food, pet supplies, toys, clothing, medications, treats, chews and much more. 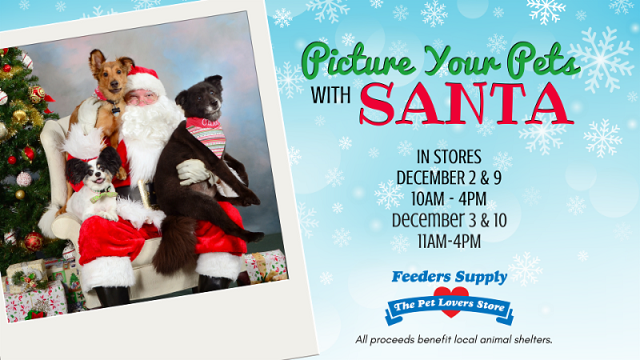 Let's say a great big thank you to Feeders Supply for all they do -- visit the store, have our pets' photos taken with Santa to support our local shelters and shop while we're there.